Samaritan’s Purse is helping meet physical and spiritual needs for thousands of displaced families in Northern Iraq. Over 3.2 million Iraqis have been displaced since January 2014—the majority were forced to flee in the wake of ISIS advances. Many escaped with little but the clothes on their backs. As ISIS fighters remain in control of large swaths of their country, families are seeking refuge in tent camps and unfinished buildings, relying on the generosity and hospitality of local Christian hosts and international support. 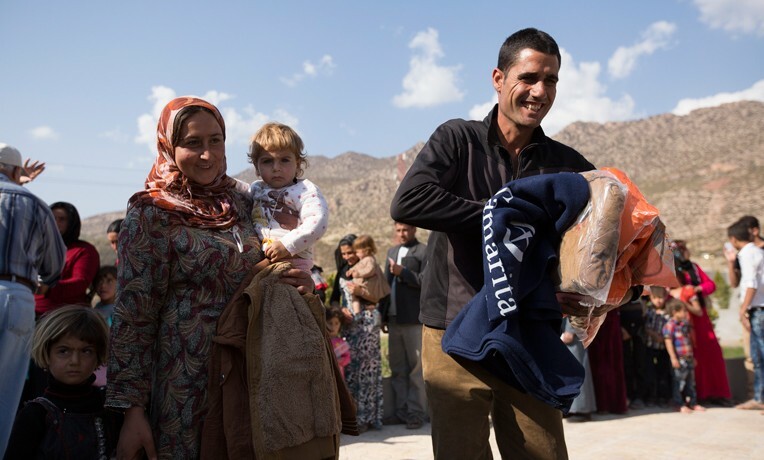 Samaritan’s Purse staff in northern Iraq have been helping these suffering families for over a year by supplying food, shelter, clean water, winter clothes, and more. We also support local ministry partners throughout the region as they provide physical relief in Jesus’ Name. See below for an update on how we are currently helping families fleeing Islamic militants. 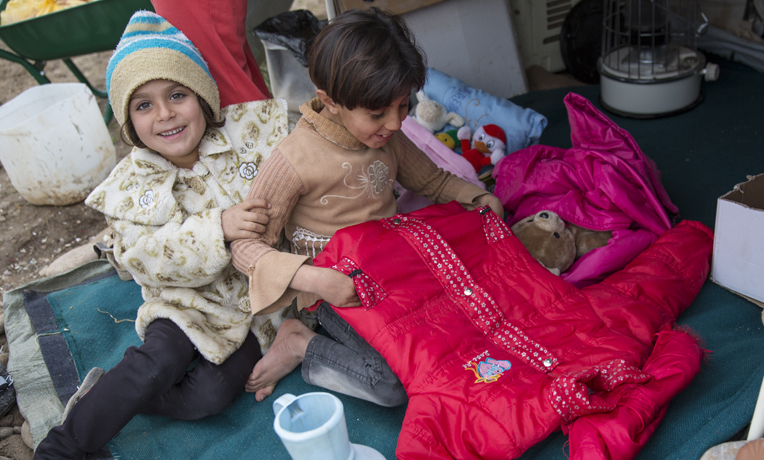 All displaced Iraqi kids have been stripped of their homes and most possessions. Many endured difficult journeys to safety. Some were further traumatized by seeing their parents or relatives killed or taken captive. Samaritan’s Purse has established child-friendly spaces where hundreds of displaced children meet five days a week for tutoring, Arabic, English, art, playtime, Bible storytime, dance, and computer activities. We are also training mobile teams that will travel to reach more children. We set up two playgrounds, with plans for three more, for children in the camps to have a safe place to run and play. Our local Christian partners in Iraq are distributing Operation Christmas Child shoebox gifts to children who have suffered tremendous loss—bringing a tangible demonstration of God’s love to conflict-weary little ones. Toys, school supplies, hygiene items, and personal notes in the shoeboxes are sure to bring some joy and comfort in this difficult season. 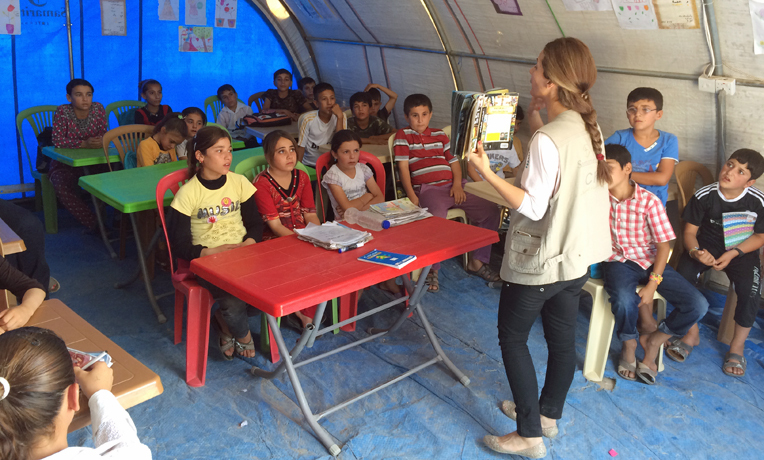 Our chaplains have also distributed school bags and school supplies to groups of children who were orphaned by ISIS. Watch our video of the children sharing what they want to be when they grow up. Our water, sanitation, and hygiene (WASH) program is serving about 50,000 displaced people in several locations, overseeing the production of more than 1 million liters of clean water daily. We are working to install toilets, handwashing stations, and septic tanks. In one camp, we just completed a 3.2 km pipeline to bring water to 4,000 people. Our WASH team also recently oversaw the transformation of a field filled with trash into a soccer field—giving young people a safe, clean place to play. Since many families ran from their homes without any belongings, they are ill-prepared to face the coming winter months. As temperatures begin to fall, we are focused on winterization—offering blankets, coats, children’s clothing, gloves, and other much-needed items to displaced families. Our two community centers both offer specialized medical services and counseling for trauma victims. One specifically serves Yazidi families directly traumatized by ISIS. The new center addresses their needs with counseling, livelihood programming, classes, and the opportunity to have fun in a safe environment. Fountain of Love offers carpentry livelihood training for men and sewing livelihood training for women, as well as sports and computer activities. The situation in northern Iraq is heartbreaking. There are few jobs, the displaced are running low on cash (if they have any at all), host communities are stretched to the limits, and there aren’t many good solutions on the near horizon. Even in best-case scenarios, people are not likely to return home for many months. Please pray for an end to the violence in Iraq and an end to the conflict in Syria that helps fuel it. Pray especially for hearts around the Middle East to be opened to the powerful truth of the Gospel. And continue to pray for Samaritan’s Purse and our partners as we seek to provide relief to displaced and refugee communities around the world. 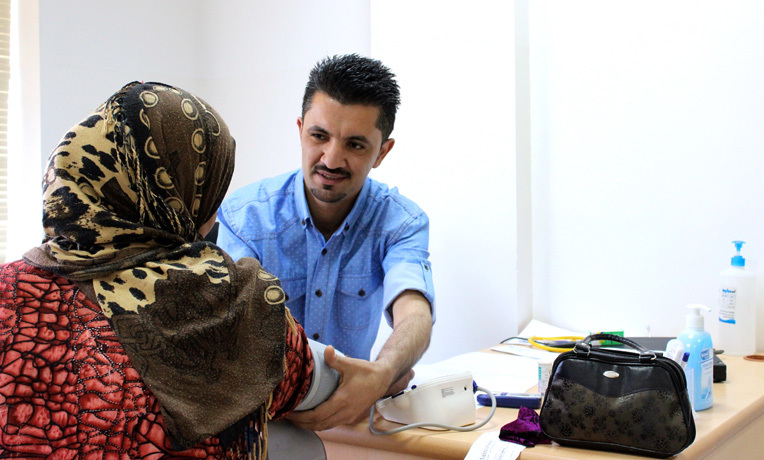 Northern Iraq Projects Samaritan's Purse continues to help meet the long-term physical and spiritual needs of those displaced by ISIS. We are offering a variety of livelihoods programs to assist the Yazidi people, many of whom are still living in displacement camps. We are also facilitating the return of Christian families to their homes and churches in the Plains of Nineveh. They need our help to repair damage, replace doors, windows, and fixtures, and paint over ISIS graffiti as they reclaim their towns in the Name of Jesus.